Greetings unto the collective Target Archery Community. Since its onset, we have always awarded metals to the top two kingdoms in each of the divisions. As of my entering office and with discussion with the assistant scorekeepers, I am please to announce that I will be adding a 3rd place award to all divisions. So now the metals will be gold for 1st place, silver for 2nd place and bronze for 3rd place. With this addition of a 3rd place winning slot in each division it is the hope to increase participation in the shoot. Welcome to the Inter-Kingdom Archery Competition Official page!! The Inter-kingdom Archery Competition, IKAC for short, is a year-long target archery tournament that allow all the archers in the Knowne World to compete in an SCA-wide competition on behalf of their Kingdoms. Each year, up to a thousand archers from almost every Kingdom submit thousand of scores in a bid to win the tournament. It is a great way for archers not just to represent their Kingdom and possibly win a great prize, but also a way for archers to compete against other archers in different parts of the Knowne World, and chart their progress in an SCA-wide setting. The competition is open to all archers, beginning and experienced. It is a great way to develop skill, and very rewarding as you see your skill increase and move up the ranks. And at all times you will be representing your Kingdom!. The competition has multiple divisions, including general target archery, period archery and special divisions for younger archers. The IKAC competition has running for over 30 years. In the following pages you will find information about the competition, current scores for this season and scores for the past ten years of the competition. The IKAC is one of the unique competitions in the SCA, as it unites archers from far off places through their common love of archery. I hope you will find the competition interesting, and rewarding, as many have through the years. If you have any questions, comments, or criticisms, do not hesitate to write to me Lord Ragnar MacHardy. If you are a marshal, have not already gotten an account, and would be willing to submit your scores via the site, please send me an email with "Account Request" as the subject. The email must include your Mundane name, Scadian Name, Home Kingdom/Group, and Email address. Scores which are submitted via the site will be given priority for getting approved and included in the official standings. The IKAC consists of seven Divisions: Open Handbow, Open Crossbow, Period Handbow, Period Crossbow, Children s Division, Youth Division and Yeoman Division. The competition starts on 1 February and ends on December 1 and any archer can participate by shooting at either an official practice or an official event. In all Divisions, each Kingdom`s score will be the average of the top 3 archer's scores. However, all scores submitted for ALL archers that participate in the competition will be shown in the database on the Scores page. 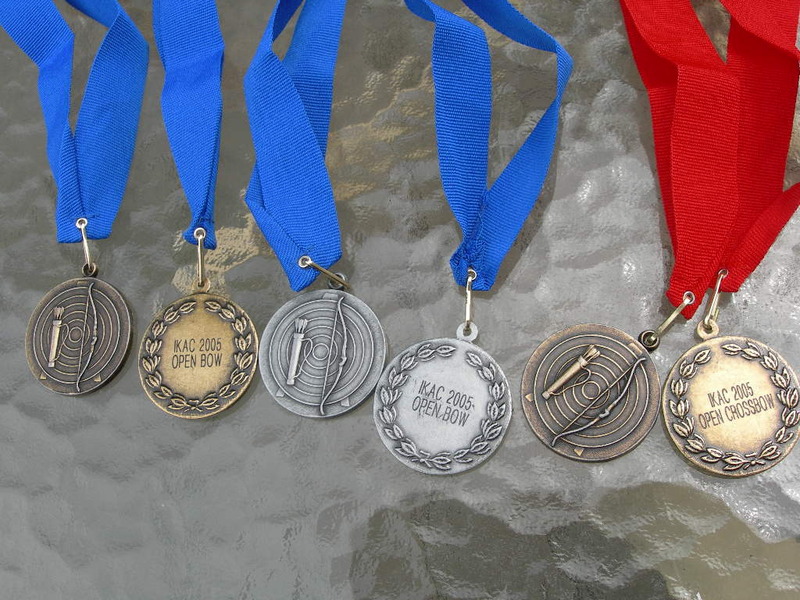 ***Prizes (As of the new 2019 season) will be given in each Target Archery Division for 1st (Golden Medallions) , 2nd (Silver Medallions) and 3rd (Bronze Medallions) place. The IKAC is very similar to a normal Royal Round, except that it has more ends. There are specific rules for each division, and they can be found on the IKAC rules page. Please make sure to read the rules carefully prior to participating. For the final official standings of all previous seasons for the IKAC see this page. The Inter Kingdom Combat Archery Competition, IKCAC for short, is a target competition shot with combat gear, which provides the combat archer of the SCA with an opportunity to compete with other archers from all Kingdoms of the Known World. It also provides an SCA wide standard of comparison for combat archery skills. Who is reviewing IKAC Scores? The IKAC is now being run much like a very large Kingdom. That is the Keeper will be the top level oversight, reviewing the rules each season, ensuring the submitted scores are getting reviewed, and providing a person to appeal to should a score get denied in review. The Keeper now has three assistant Scorekeepers who will be doing the actual review and approval of scores for different portions of the IKAC. This setup provides cover for modern life intrusions and an appeal path by a different person about any disagreements. If your not having fun your doing it wrong.